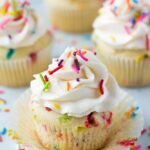 Fluffy, soft, homemade funfetti vegan cupcakes are the perfect way to celebrate! These are so much better than anything you can get in a box, and they aren't that difficult to make. Add the liquid from a can of chickpeas to a small bowl and whisk until foam forms on top, about 1-2 minutes. This is your egg replacement. When ready to use, measure 6 tablespoons. Combine the almond milk and apple cider vinegar and stir a little. Set aside to curdle for a few minutes. In a large mixing bowl, add the softened vegan butter and sugar. Mix with an electric hand mixer on medium speed until creamed together, about 2 minutes. Now add in the 6 tablespoons whipped aquafaba and vanilla. Mix on medium speed again until well combined, about 1 minute. With the mixer on low, add the dry ingredients in this order: flour, baking powder, baking soda, salt. Mix until just incorporated. Now slowly pour in the almond milk mixture, and continue to mix until smooth and well combined. Fold in the 1/2 cup of sprinkles, gently with a spoon. Fill the liners 2/3 full and bake for 20-24 minutes, until a toothpick inserted comes out clean. Completely cool the cupcakes before frosting. Frost generously with Vanilla Vegan Frosting. Top with more sprinkles. I prefer Earth Balance brand for vegan butter. Get the sticks if you can. You can substitute all purpose flour for the cake flour if you must, but cake flour will yield fluffier results. Jimmies sprinkles are the best for funfetti cupcakes, so try to use them if you can!